We’re still swimming in a sea of tomatoes here at Tumbleweed Farm and this simple late summer salad is absolutely perfect. 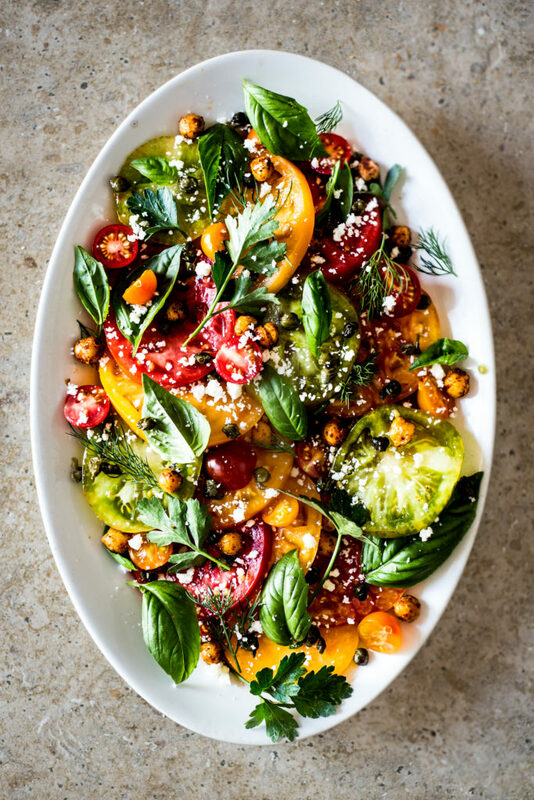 Fresh herbs, juicy tomatoes, a tangy dressing, fried chickpeas and capers, plus a sprinkling of feta cheese make this salad so damn good that it’s reason enough to crack open a bottle of champagne and toast to the flavors of the season! I hope you ell enjoy this tasty side dish as much as we do. Cheers from Tumbleweed Farm! This was great. it makes a really nice summer dinner with some crusty bread. Thank you! I made this recipe last weekend with fresh cherry and pink tomatoes I piked up from the farmers market. It was delicious! Will be a go to tomato salad especially when in season. Soooo good! I used all grape tomatoes sliced in half and cilantro parsley.